Who doesn’t love cupcakes? Today, cupcakes are HUGE in popularity and gourmet cupcake shops are popping up all over. Since we love all things Gingerbread, this Gingerbread cupcake really “takes the cake”. Recipe here! For the Gingerbread lover in everyone! 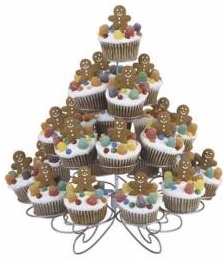 Delicious Gingerbread cupcakes topped with decorated Gingerbread cookies. The festive treat can be partially made ahead by baking and decorating cookies in advance. Ice cupcakes, position cookies just before serving! Visit here for the pattern.